Well it’s been a short week after the Bank Holiday, but we have put in a grant bid to a GMT for “Surrey Youth Enterprise” - one day workshops, mentors, website and advice service to young people about how to become self-employed/set up a social enterprise. We are then pitching to the Lottery. I am sure that self employment/setting up a business is the right way to develop for many young people. As an example of what is possible, I had lunch on Wednesday with the hugely impressive young man who started up his own youth market research company when aged 16 ..and now is 22. The company is called "The Eleven" and is working on a magazine style website for young people in Surrey giving news, reviews, lifestyle, health, social issues, places to go, things to do info. The website will be called SURGE. All this is within the Surrey CC contract with Working Links, with whom I also met this week, to provide careers advice to young people. Even I am excited by the opportunities and insights that this can bring to young people. I think it’s just great. I am also working on a grant bid with uniformed organisations to expand participation by young people in scouts, guides , military cadets and so on. The contribution of the uniformed organisations to civil society is hugely important – hence the front page headline in “The Times” (25 August) – “Government sends in the scouts to riot hotspots” . It’s about a consortium of uniformed organisations being funded by Government to set up new units in deprived inner city areas. Our grant bid is along similar lines, but addressing the price of success….unblocking the waiting lists for Scouts and Guides in Surrey, and increasing participation in the military cadets. Talking of ambition, regular readers will have endured the stories of my studying for a MA Theology these last three years – well I have passed with Merit, so I am very pleased.. realising ambitions..which we all need to have. I’ll tell you the next cunning plan- ambition next time. No blog for a bit now..too busy relaxing in France . This has been a busy and tricky week, though with high spots derived from being in touch with youth workers and young people…is it too late for me to be a youth worker?? Interesting that it always the frontline that’s the best place to be...doing the delivery which brings its own rewards, though not financially, and there’s the rub. We pay for managers not deliverers. On Monday I was at NESCOT talking about youth enterprise / employment and met again with Working Links (the contractor delivering web based career guidance in Surrey) and their sub-contractor “The Eleven” which is a small London based youth market research company. The founder is aged 22 and he is the oldest in the company, and was very impressive indeed. They are setting up a website (“SURGE”) that will provide info on places to go/things to do, but this will be wrapped around with news and features. ALL determined by young people only – they will be the editors/arbiters about what goes up on the site. The founder’s comment was – max of 300 words and must have a video. Sign of the times. I was very impressed. We have a new Trustee starting shortly from the Scouts – Cliff Sheard - and we have welcomed him…stacks of experience and a practicing accountant. I visited the Surrey Credit Union as they might provide start-up loans to young people; they do great work and are wanting to expand rapidly. I met on Thursday with Matrix at Allen House (Guildford) which is currently offering the best coffee and brownies anywhere...knocks Costa to the north pole. In the afternoon I met with Lifetrain, and then the great young people and youth workers at the B Free Youth café in Leatherhead (at much converted church). The purpose of the visit was to talk to young people about their views on self-employment/setting up a social enterprise. We had a great discussion - I got an iced coffee but had to buy Dominos Pizzas. We then talked more widely about their experiences…cyber bullying, depression, self-harming, and experiences of their friends about homelessness and so on. It sounds rather negative but the discussion was great – realistic, positive. In terms of our Surrey Youth Enterprise Wates and Lottery bids - about two-thirds of the group had plans to set up as sole traders/self-employed, but don’t know how to do it. I rest my case. Various operational and strategic discussions this (Friday) morning, so a busy week. It’s the young people (“The Eleven” and at B Free) that stick in my mind. I am supposed to be sailing in the Solent tomorrow (Sat) but the wind is Force 7 so it may be off. Final day of our local Music Arts Drama festival on Monday – 5,000 people at live bands / beer tent/food/ fireworks – should be fun! Have fun (despite the weather)! It was good to be at Surrey Sports Board on Monday exchanging perceptions of the Olympics, and discussing how to establish Active Surrey as at least a quasi -independent body and maybe a full social enterprise (at present Active Surrey is hosted by Surrey CC). On Tuesday, I was at a half day workshop about mentoring skills - in advance of our Surrey Youth Enterprise bid, and to develop my own skill as a potential mentor for helping young people into start-ups of self–employment or social enterprise. It was a very useful half- day, delivered by trainers from South-east Social Enterprise for the Training and Development Partnership. by “our” social enterprise. GASP are very interested, which is great. This is a very developmental period for Surrey Youth Focus as we bid for grants to undertake projects in the near future. In pursuance of our bids for Funding Surrey Youth Enterprise, and in addition to having a statistical analysis of need and having views of young people through focus groups, we are now testing out the evidence of need for this support service by a survey monkey survey that has gone to young people (aged 16-24) through our Members. Hopefully the results will be positive. Other ideas being looked at with Trustees are to build a SYF business network that enables businesses and corporates to focus on, and contribute to the achievements of young people. We are thinking of greatly expanding our annual Celebration of Youth to be the centrepoint of this initiative. So hopefully we are indeed enterprising! Chief Executive has Tardis – Next Dr Who? Well summer is here, and the GB Team keeps winning which is great. This has seemed like a quiet week for me with few meetings, but some important developments. One needs time to think strategically as well as "to do" operationally….as well as “to be” – but that's a bit philosophical for a hot Friday! Our Board of Trustees has approved our three year strategy and we have now identified the key projects to take forward using a combination of staff and Trustees to undertake the implementation. These will be slowly revealed in future weeks and months. It is clear that the future will not be the same as the present, but we have a clear sense of direction about what to achieve….we just need to do it, and have a bit of good fortune too. We are constantly building our links to businesses and our profile in enabling volunteering. We also have 1,300 followers on Twitter now, which is great. It is clear that the legacy of the Olympics will not just be in sport, or even in buildings, but in the public’s attitude to volunteering where this captures the imagination and the emotional buy-in, which clearly the Olympics does. 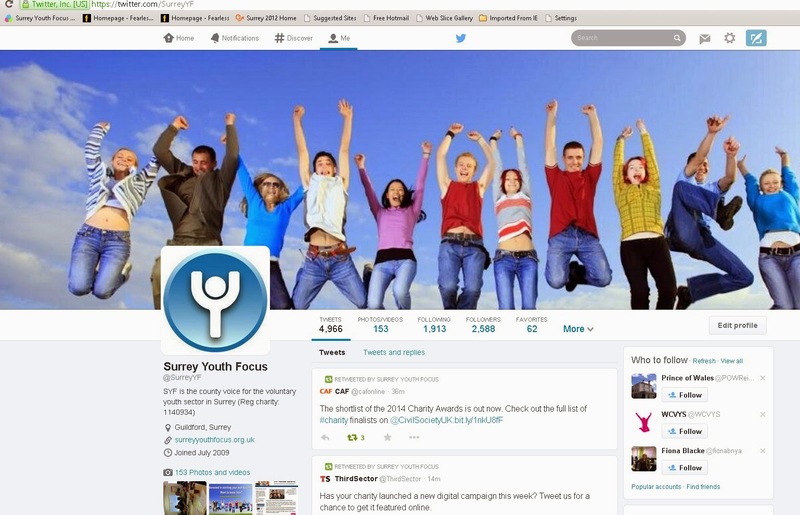 Anyway, looking back from 2013 (in my Tardis) I predict that this week will have been an important one for the development of Surrey Youth Focus! Enjoy the sun..but don’t invest in Man Utd shares..and I’m a fan! Well the GB Team has come good this week with 5 Golds as of this Friday (3rd Aug) morning. The message of having faith in the team, and carrying on, being well made! I have had a “different” week, not just because of the Olympics, but because on Wednesday I was live on the Shah Jahan radio site discussing “Young people and spirituality “ with lovely people from different faiths – a Muslim, a Sufi (the mystical branch of Islam), a Jew, and me as a Christian. The debate was hosted by the Diocesan Interfaith Adviser, who also happens to be the wife of the Imam. We all enjoyed the discussion and were struck by the similarities between faiths, whilst acknowledging the very real differences. My own view is that children and young people do have an innate spiritual capacity which is then squashed by commercialism, the worst aspects of the internet and social media, and peer pressures. That a spiritual capacity survives is reflected in the wonderful altruism, social awareness, and self-giving that so many young people have in their late teens and early twenties reflected in charitable work in the UK and overseas, volunteering, fund-raising etc By the way there are excellent publications by the National Youth Agency about young people and spirituality that are not didactic or religious. On Tuesday my Chairman and I met with our counterparts in West Sussex in pursuance of a strategic intention to build Surrey/Sussex links about collaboration and mutual support. It was an excellent meeting, and we quickly identified areas for collaboration. Hanna (West Sussex CVYS) will be coming to our next Trustees meeting, and vice versa so that the links are built between us. Talking of Trustees we had an excellent meeting on Tuesday evening at which two new Trustees were introduced. We have a very capable Board. The key items were signing off the Report and Accounts for 2011/12 and approving our 3 year strategy. Encouragingly Trustees have volunteered to work with us staff to take particular objectives forward. For the rest I am concentrating on two grant bids: one to the Lottery for ourselves, and the second bid is for our uniformed organisations to the Armed Forces Community Covenant Grant Fund. Both bids are of the highest importance. These need to be ready by the end of August, whereupon I need to have confidence (faith) in the value of what we’re doing, as indeed I do! Gone missing? Doh....not me of course….tied to the desk…but we do allow people to go on holiday here, and Karen, my secret blog installer is off on holiday. So this won’t be seen until a week or two. Meanwhile some of us are doing the work! It has been very hot in the office this 31C week, but good things have been going on. I met early this morning with someone who is a specialist counsellor to young people. I very much hope she will join Surrey Youth Focus as we do not have any member organisation with those precise skills. I was at the Lottery yesterday being advised about our “Surrey Youth Enterprise” bid. There was considerable encouragement to put in a 3 year bid, but first to ascertain the need for this support service, and also to engage young people more actively in the management and development of the project. We can do both things in short order and then will bid. I have also been preparing for our meeting next week with a grant-making trust about this project. Our terrific volunteer Research Assistant, Sandip Malli started yesterday. She is working on a Research Report about the issues faced by young people that we want to put to Trustees in October and then publish widely. Sandip will also be helping set up our “100 Focus Group “ of 100 young people which I hope can be a virtual focus group for us able to respond to questions from us, and amongst themselves. I met on Monday with the businessman with whom we’re setting up the social enterprise and we are in the process of doing a deal on premises in Leatherhead. We are all hoping that the CiC can start in September. So it’s been another good week, though I confess distracting because of the great weather and the Olympic build – up!